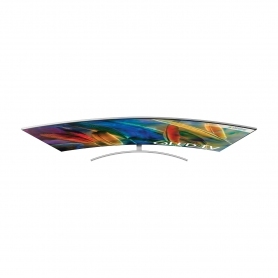 As part of Samsung’s QLED range, the QE75Q8CAMTXXU offers a level of detail and lifelike colour beyond that of other UHD models. Make the most of this Smart TV’s built-in Wi-Fi with a huge range of features to upscale and improve content. Even with its processing power, this model holds an 'A' rating for energy efficiency, keeping running costs down. The QE75Q8CAMTXXU comes in a sterling silver colour to suit any modern home. 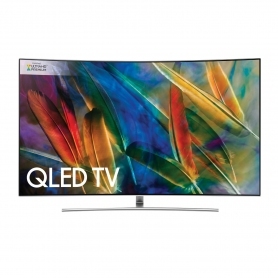 Q Processing Engine – With this powerful processor, this Samsung TV can multi-task at super-fast speeds. Enjoy improved picture quality across all of your content and a boost to streaming capabilities. Q Colour – Thanks to Q Colour, this QLED TV can express 100% colour volume, a world first. Most TVs lose the range of colours they can produce as brightness increases, but this is not the case for the QE75Q8CAMTXXU. No matter how bright your screen, a Quantum Dot display means you can still see a full range of true to life colours. Q Contrast – Due to their low light reflectivity, QLED TVs can provide perfect contrast to suit the lighting of any room. Bright or dark, this Smart TV will stay looking its best. Q HDR 1500 – An improved dynamic range on the QE75Q8CAMTXXU gives more vivid colour, striking brightness and sharper shadows. Q Viewing Angle – Get a great view from every seat with the QE75Q8CAMTXXU. With its curved screen and wide viewing angles, colours stay vibrant no matter where you watch from. 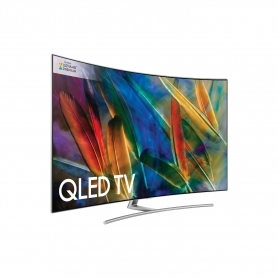 Experience content like never before with Quantum Dot technology from Samsung. Bring the world into your living room with a full gamut of colours on this QLED TV’s 75-inch screen. TVPlus tuners allow you to watch subscription-free HD content through your aerial or dish. Choose from over 200 TV and radio channels, and catch-up services such as iPlayer, All4 and ITV Hub. You can even pause live TV, to ensure you never miss a moment. Samsung TV Plus extends your range of viewing options even further, letting you purchase the latest films and series through your TV, or check out new trailers. Use the EPG to easily navigate through channels, time slots and Samsung TV Plus. Samsung’s range of cloud gaming titles lets you play games without a console – simply connect a gamepad and enjoy a variety of recent releases. The QE75Q8CAMTXXU is also compatible with Steam Link, letting you play and stream your entire Steam library on its large screen. This model comes with a Samsung One Control remote, which can be used to scroll through channels or surf the web. One Control is also compatible with devices such as Blu-Ray players and soundbars, for all-in-one control of your devices. The ‘Smart View’ feature means you can also control the TV with your smartphone, or stream content from it onto the QLED screen. UHD Upscaling – Upscale all of your content to look as close to UHD quality as possible with this clever feature. You’ll even see the benefit on HD and SD footage. Precision Black Pro – Dims LEDs behind the screen for a greater range of light and dark shades. See deeper blacks and purer whites. Supreme UHD Dimming – By dividing the screen into hundreds of smaller ‘zones’, this feature can scan and adjust each individual zone for perfect colour balance. Colour, brightness and sharpness are tailored for every part of the screen. Auto Depth Enhancer – By boosting contrast in key areas of the screen, this feature gives an enhanced sense of depth to scenes. Supreme Motion – Faster image-processing and frame refresh rates deliver smooth, judder-free motion across content. This model also features 10-bit colour, giving it access to just over one billion colours and combinations. With 60 W RMS sound output, the QE75Q8CAMTXXU has a wide volume range to complement its UHD display. Back up your QLED screen’s sharp detail and intense picture with booming sound. 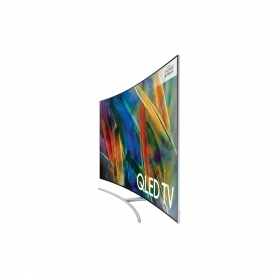 A Samsung ‘One Connect’ box also comes with this Smart TV. This box uses a range of ports to help keep the back of your TV tidy. Connect all of your devices to the One Connect box, then use its single, near-invisible cable to plug the box into the TV. Use the USB port to insert an external memory drive and enjoy personal photos, videos and music. Is one cable still too much clutter? This model’s steel stand can be used to hide cables from view, for a simple, minimal look. Alternatively, if you’d rather plug devices directly into your Samsung TV, it has four HDMI ports at the back of its screen. In box – A short, wide-based stand. Perfect for those who want to place their screen on a table. 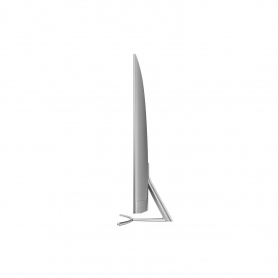 Studio – A tall stand, giving the QE75Q8CAMTXXU more height should you wish to position it on the floor. 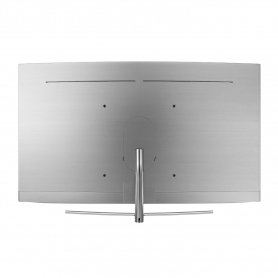 No Gap Wall Mount – For those that would rather go without a stand. This mount lets you fix your QLED TV flush against the wall. Find the right look for your QE75Q8CAMTXXU with Samsung’s range of accessories. 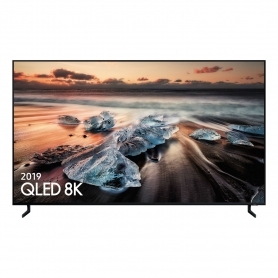 The Samsung QE75Q8CAMTXXU features a huge list of Samsung and Quantum Dot technologies to give the best possible picture and performance. Order yours today.